« Barry and Mitt — Who Won? Dunbar’s Number: Why My Clients Hire Me? Want to join my social circle? I’ve noticed a pattern among my clients. Many of them are small software companies with good ideas that are growing rapidly. When they first call me, they have approximately 150 employees. I’ve often wondered, what is it that triggers a problem — and a call to an outsider — at 150 employees? Then I discovered Dunbar’s number and the pattern started to make sense. Robin Dunbar, a British anthropologist, is an expert on the social lives of monkeys. (Wouldn’t you love to have a job like that?) 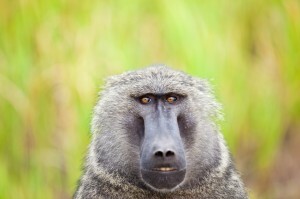 Dunbar made an interesting observation: Monkeys with small brains have small social circles. Monkeys with larger brains have larger social circles. Actually, it’s not total brain size — it’s the size of the neocortex, the area of the brain where we do our abstract reasoning. 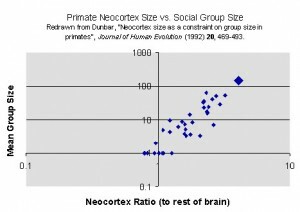 In Dunbar’s charts, you’ll find a distinct up-and-to-the-right relationship between the size of the neocortex (relative to the rest of the brain) and the size of the social group. So, you might wonder, how does this affect the lives of large-brained primates known as humans? How big is our “natural” social group? Funny you should ask. Dunbar frames the question this way: what’s the largest number of people in which it’s possible for everyone to know each other and also to know how everyone relates to everyone else? The answer is slippery but it seems to be around 150 people (plus or minus, oh, say 30). If you search the topic on the web, you’ll find a number of observers arguing for a higher number. (I didn’t find any arguing for a lower number). On the other hand, you’ll also find observers who claim that 150 occurs frequently and “naturally” in traditional societies. Apparently, the Roman Legions were divided into companies of 150 men. Church parishes in 18th century England contained 150 people. If your parish grew bigger, the bishop would campaign for an additional church. Maybe this is why companies call me when they reach about 150 employees. They’re growing up and they’re feeling the growing pains. It’s not as simple as it used to be. In fact, it’s getting rather complicated. I hope they keep calling me. I’m becoming a bit of a specialist. You can find Dunbar’s original article here. 2 Responses to Dunbar’s Number: Why My Clients Hire Me?